1. Preheat the oven to 200˚C, gas mark 6. Peel and deseed the squash; cut it into 2-3cm cubes. Toss with 1 tbsp olive oil and spread out on a large baking tray. Season and roast for 35 minutes, turning halfway, until golden and tender; set aside. Meanwhile, put 2 tbsp olive oil in a cold frying pan with the bruised garlic and set over a low-medium heat. Cook gently, stirring, until the garlic begins to sizzle and turn slightly golden, about 3 minutes. Remove with a slotted spoon and set aside. Add the bread to the pan, turn the heat up a little and cook, stirring often, for 3-4 minutes, until golden and crisp. Season, stir in the parsley and set aside. 2. Put the garlic in a small food processor or blender with the mustard, worcestershire sauce, lemon juice, grated parmesan, the remaining 5 tbsp oil, anchovy (if using) and 2 tbsp warm water. Blend until smooth; season with black pepper and salt, if needed (if you are using the anchovy, you won’t need salt). Mix with a spoon to bring it together, if necessary. 3. Shred the baby greens and toss with the dressing in a serving bowl, leaving to tenderise for 10-15 minutes, while you poach the eggs. Bring a large, shallow pan of water to a gentle simmer and poach the eggs for 3-4 minutes. Carefully remove with a slotted spoon; drain on kitchen paper. 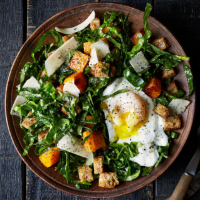 Tumble the squash, shaved parmesan and croutons through the greens. Top each with a poached egg to serve.